“Immortal Romance” is an online slot by Microgaming, one of the world’s leading software providers in the digital gambling industry that claims to have been the first to release a true online casino as early as 1994. Microgaming, based on the Isle of Man, boasts more than 850 genuine casino games, and continues releasing fresh titles every month. Vampires have been a fashionable topic ever since “Interview with the Vampire”, a drop-dead beautiful movie based on a novel by Ann Rice, was released in 1994 (sic!). Since then, the concept has undergone numerous changes: the vampires have been depicted as pure evil (From Dusk Till Dawn), as tortured souls (Bram Stocker’s Dracula), as a race of fighters that once dominated the world (Underworld), as politicians pulling the world’s strings from behind the curtain (True Blood), as video bloggers (What We Do in the Shadows), and even as vegetarians (Twilight). Even Shakespeare was revealed to be a mask, a pen-name of an immortal being that feeds on human blood (Only Lovers Left Alive). Despite multiple interpretations, there is one theme that permeates all the stories: love. The idea of undying romance (or a romance with an undead creature, if you will) has been explored from every angle, and still attracts both viewers and storytellers – an enigmatic and evasive subject that may never be explained in full. 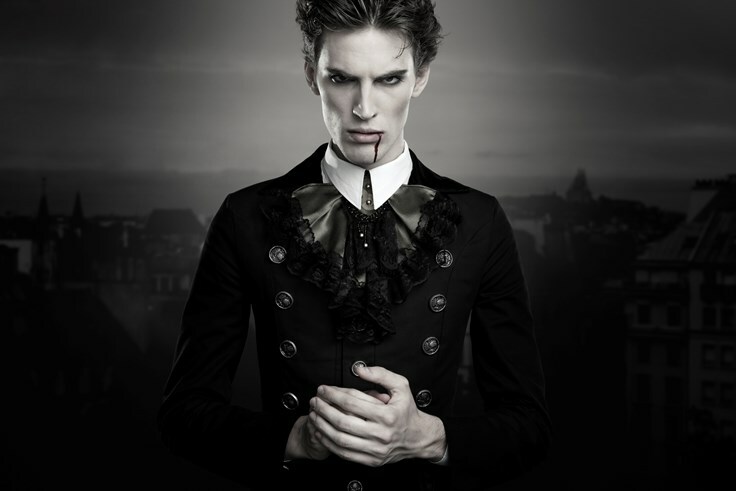 With the growing trend for glamorization and, so to speak, de-fang-ization, a vampire love story has gone a long way from a gory drama in which a maiden encounters a loathsome beast to a young adult romance, full of angst, emotional (if a bit incoherent) dialogues, and perfect eye makeup. These stories have found place for themselves both in the cinemas and on the TV screen (the notorious “Twilight” being the epitome of a glamorous undead love affair) and have introduced new stereotypes that are now widely recognized across the Western culture. When designing the “immortal Romance” slot, Microgaming seems to have found visual inspiration is some of the most successful girl+vampire pieces of fiction of the 2000-s. The game tells a story of “forbidden love and dark desire”. The main characters are a beautiful young woman (naturally), two dangerous yet seductive vampires, and an irresistibly charming witch. While this composition cries “Vampire Diaries!”, the portraits of the four bring to mind none other than “True Blood”, with one of the vampires rocking a slightly shabby look à la Bill, and the other one displaying a cool Skarsgårdian façade, just waiting to reveal the bloodthirsty psychopath within. 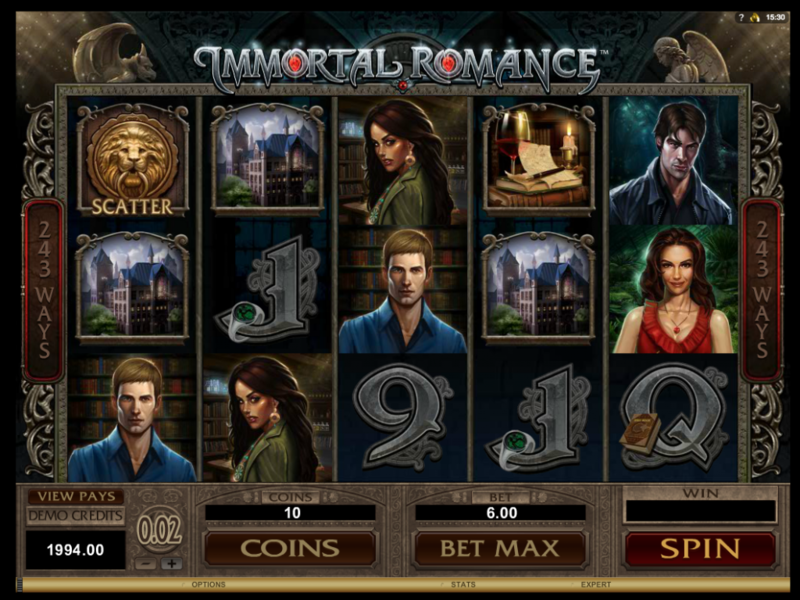 The dark, gothic “Immortal Romance” slot has 5 reels, 243 winning combinations, and an alluring jackpot of 60 000 coins. 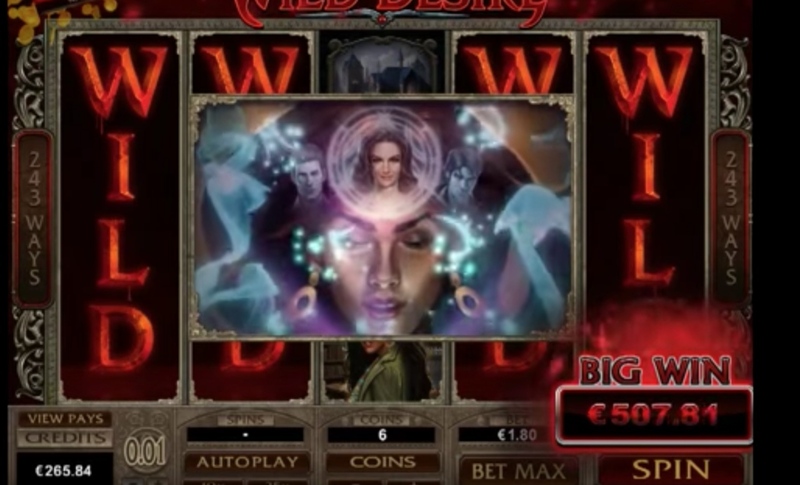 Since this is an Microgaming slot at its best, the payouts are rather high: even the lowest-paying symbol which has the lowest-frequency combination pays out one coin, while the Wilds can pay out a generous sum of 300 coins maximum. The top payout is a dazzling sum of 3,645,000 coins, which is considerably more than was offered by “Thunderstruck II”, the game’s venerable ancestor. The game has a medium volatility, and its RTP is a solid 96,86%. The minimum bet per spin is €0.30, and it can go up as high as €300. The special features are Wilds, multipliers, Chamber of Spins, and, quite appropriately, a Wild Desire feature. To enter the mysterious Chamber of Spins, you need three, four, or five lion door knocker symbols to land on the reels. Like any decent secret chamber, this one keeps secrets within secrets: there are four levels for you to discover. The new levels open to you when the feature has been retriggered a certain number of times. Amber (1-4 retriggers), the dark-haired lady, grants you ten free spins with x5 multiplier. The spins can be retriggered, if she’s feeling generous. Troy (5-9 retriggers), the menacingly attractive character wearing a shabby leather coat and a meaningful frown, gets you fifteen free spins. When vampire bats flutter over the random reels, these are transformed into x2 and x3 multipliers, so if you get two of those, you end up having an x6 multiplier. Michael (10-14 retriggers), the tall blond with shelves full of books in the background of his portrait, triggers twenty free spins with the rolling reels feature. Rolling reels means that every time you get a winning spin the symbols that compose it are transformed into something else. The multiplier is increased from x2 to x5 as you keep on winning. Sarah (15+ retriggers), the diabolical femme fatale wearing a red dress and a carnivorous smile, showers you with twenty-five free spins. The Wild Vine symbol that twists and curves on the third reel transforms other random symbols into wilds. If two to four random symbols drop on your reels, you will receive from one to four free spins, so that there are twenty-nine free spins to enjoy in total. This feature is triggered quite randomly, and its effect is tempestuous: up to five reels can go fully wild, so there are some juicy wins to be had. “Immortal Romance” is, essentially, “Thunderstruck II”, but with a bigger maximum payout (bigger by 1,245,000, to be precise) and a gothic twist. It’s star feature, the Chamber of Spins bonus game with four levels, is as exciting as it is rewarding. The gameplay is flawless, and the beautiful music adds a final touch to the atmosphere of an infernal love affair. The portraits of the main characters look like they have been painted on the canvas a couple of centuries ago, and have now been brought down from an attic, draped in cobwebs, but glaring at you with eyes that are alive and alert, preparing to step out of their tarnished frames. Overall, it is an excellent, high-quality slot, dark and beautiful, filled with secrets that can, in turn, fill your pockets with gold. Depending on how much you are prepared to bet on a spin, this slot is a universal one, suitable for both high-rollers and casual players. Immortal Romance can be played at Bitcasino.io.